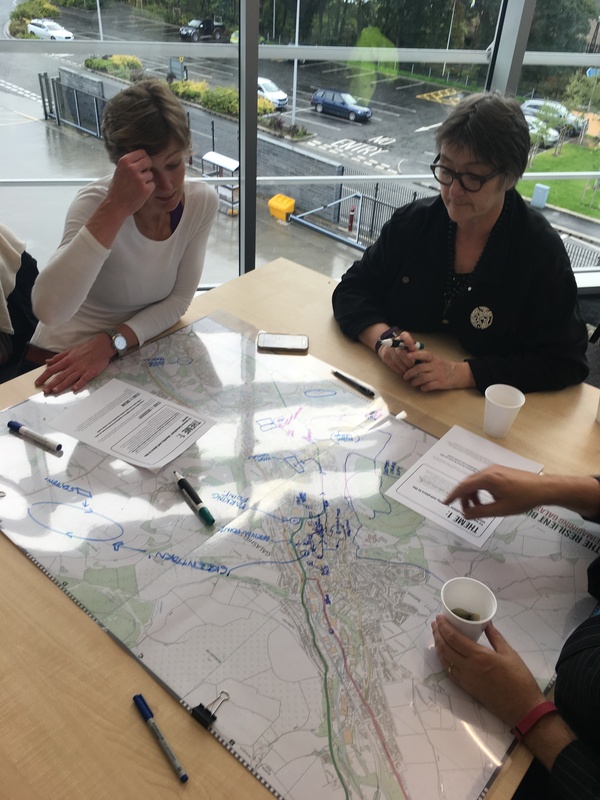 From workshop to exhibition, this project was about putting together an ambitious plan for how you want Galashiels to be in 2040. How do you imagine a prosperous, resilient, and cohesive community? We used work completed by postgraduate design students as a starting point for a series of workshops that asked these questions. Community workshops asked participants to look at all the work, rate the projects to a series of sustainable metrics, and ultimately agree on a series of themes. Specifically, the second workshop embedded these themes in the town as a series of ambitious and far-reaching proposals. We’ve taken these, and presented them as a vision of how that town can be 25 years in the future. We’ve taken the student work and used this again to help visualise what these developments might really mean. 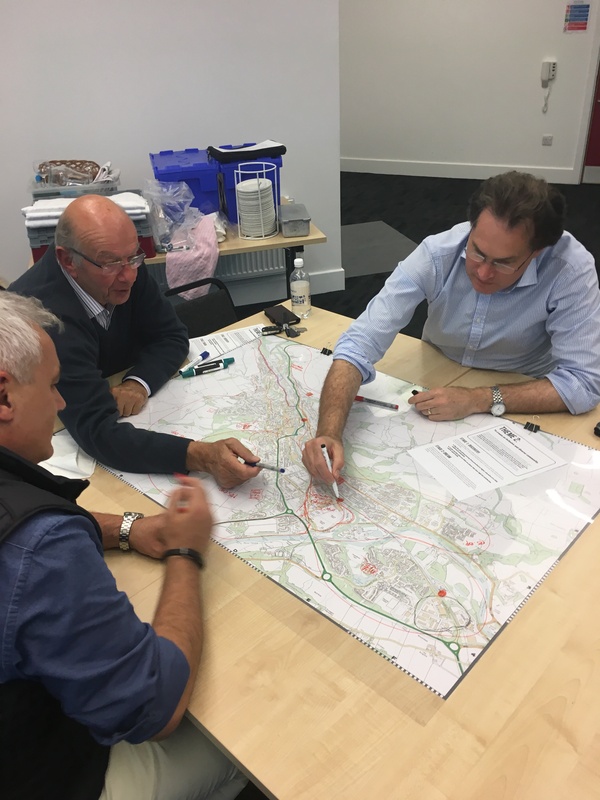 What you’ve proved is that the town itself is as ambitious as any student project in planning a sustainable and resilient town, fit for the future. 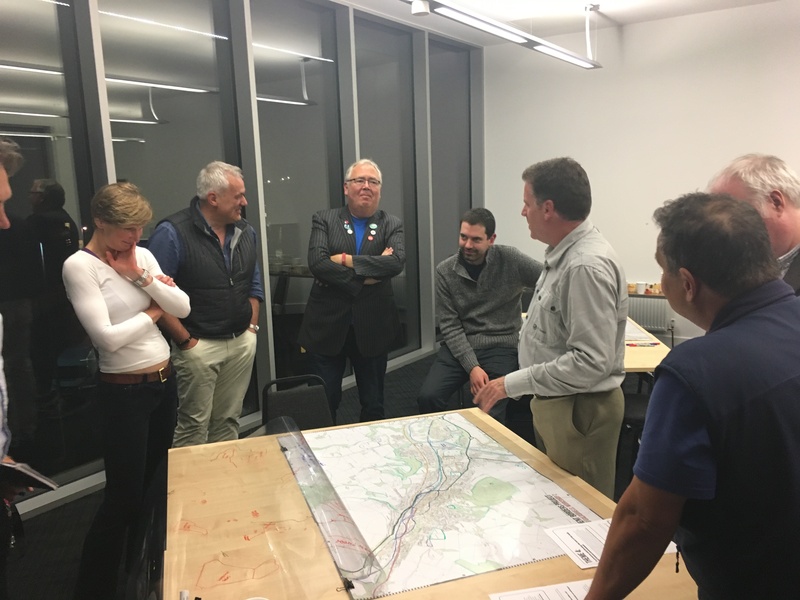 Throughout this process a bold vision for the future of Galashiels has emerged both from ideas brought forward in the workshops as well as from the postraduate student’s projects. 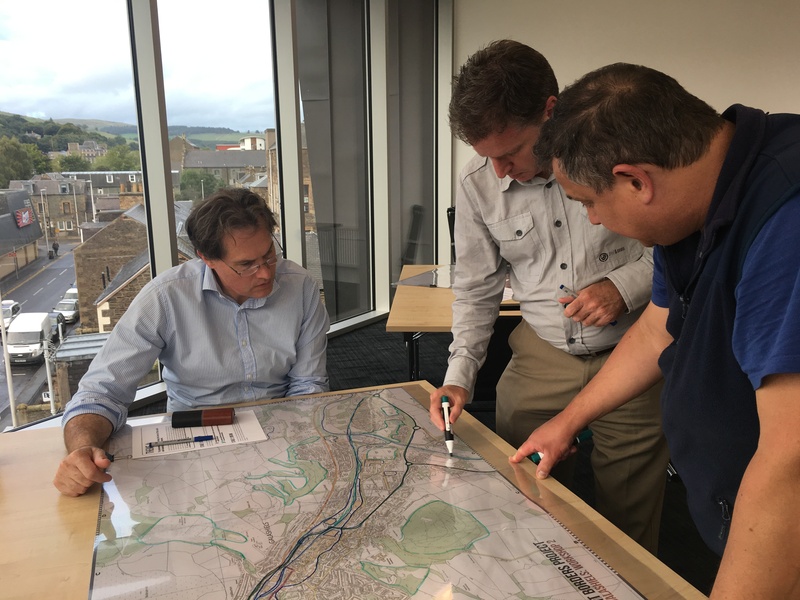 Thus, this exhibition maps and links the outcome strategies and their possible materialisation as a coherent vision for a sustainable Galashiels in 2040. What value does this work have in the longer term? 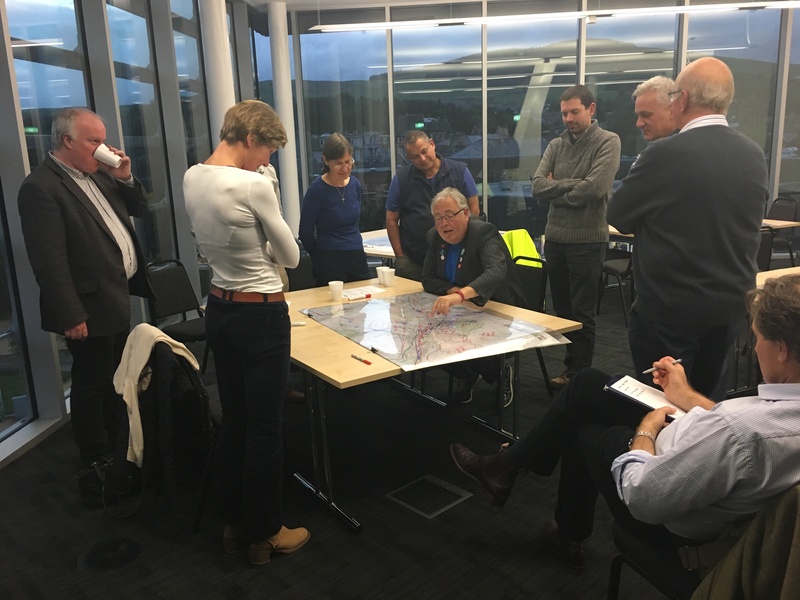 Over the years, you will be asked for your views and opinions for developing Galashiels. Some of the work here can be used to put together a more ambitious vision than what is often the outcome. We hope it allows you to see the town, differently. The coming of the railway was a milestone for the town, but its natural, economic and cultural assests are strong too. This project simply suggests some of the possibilities open to you all. 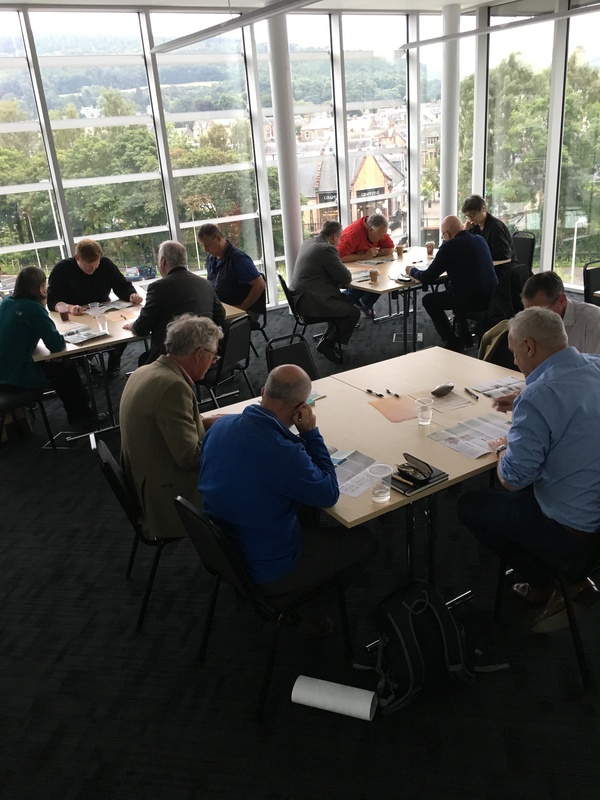 The workshop identified different sources of renewable energies to help Galashiels 2040 become a more self sufficient and sustainable town. The waterways are used to generete clean energy through a network of hydropower stations. Wind farms are be strategically placed to capture winds, and Solar panel grids are proposed in south-facing fields. 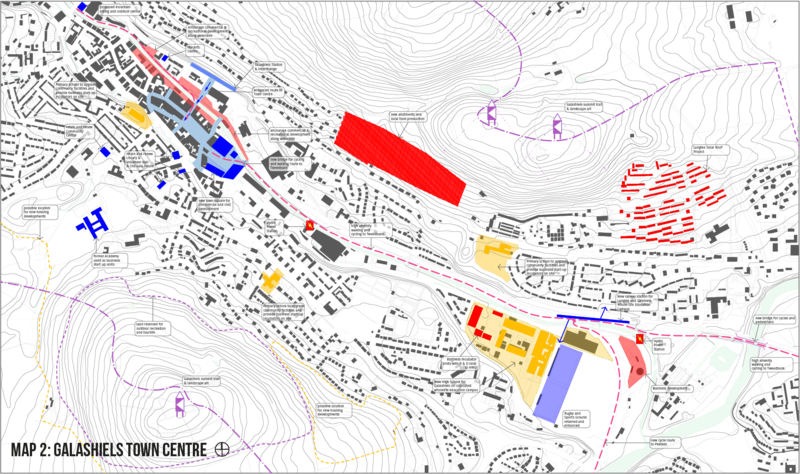 One aspect of Galashiels 2040 that was not fully explored by the design students was accommodating housing growth to reflect new travel-to-work and pressure on housing in the Central Belt. 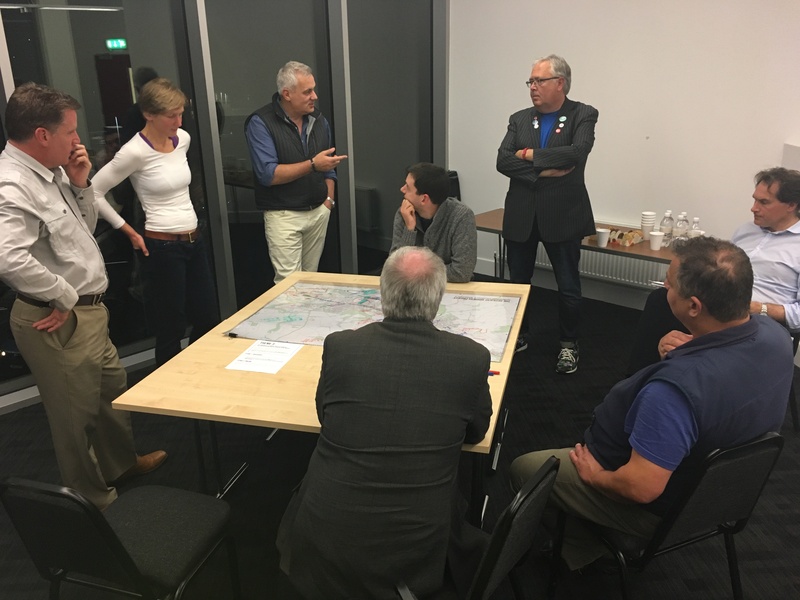 The community workshops picked up the slack and thought carefully about the implications of long term expansion. Their proposals were a combination of infil and extension along with ambitious expansion around the east. Cohesion and inclusiveness were a key consideration to ensure a mix of housing type and tenure. The workshops identified small business development as being important to long term resilience. Small market garden enterprises were suggested as well as growing key sites around the University and existing provision at Tweedbank. 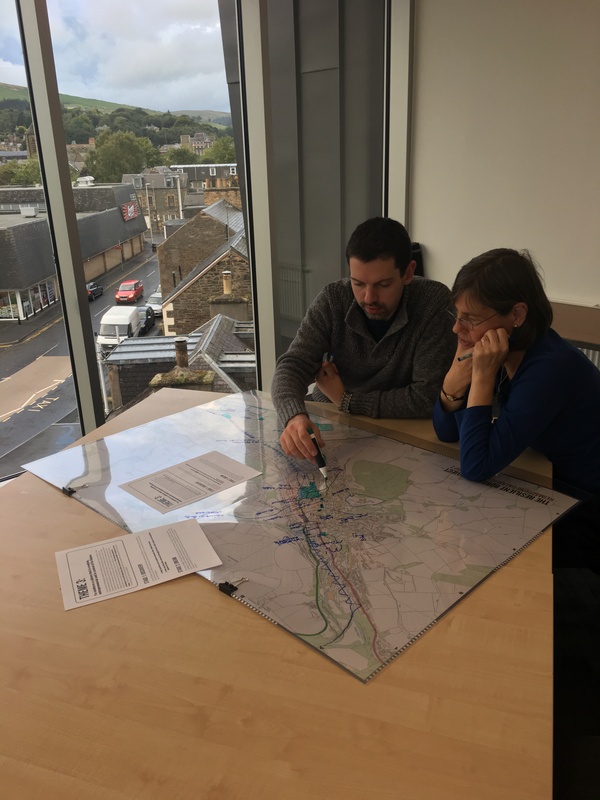 The town centre is transformed to provide clear routes and memorable places for the visitor, to make Galashiels a distinctive shopping centre with a wide catchment area. Opening up streets from the station and the making of a new commercial square provides opportunity for growth and expansion. Our workshops thought carefully about how education and training can forge more cohesive communities. In particular the size and number of primary schools was debated. In the end, it was proposed that a campus for whole life learning and development be located adjacent to the University. It would include the High School, Further Education as well as business incubator and start-ups. The primary schools are all located really close to their catchment communities. The workshops thought that again these sites could be enhanced with more facilities to address the needs of all ages. A combination of a strong textile heritage, and a compact town centre surrounded by a rich landscape means that new sustainable development compelling proposition. A transformed town centre acts as a starting point for recreational pursuits including a summit art trail and mountain biking routes served by a new centre. 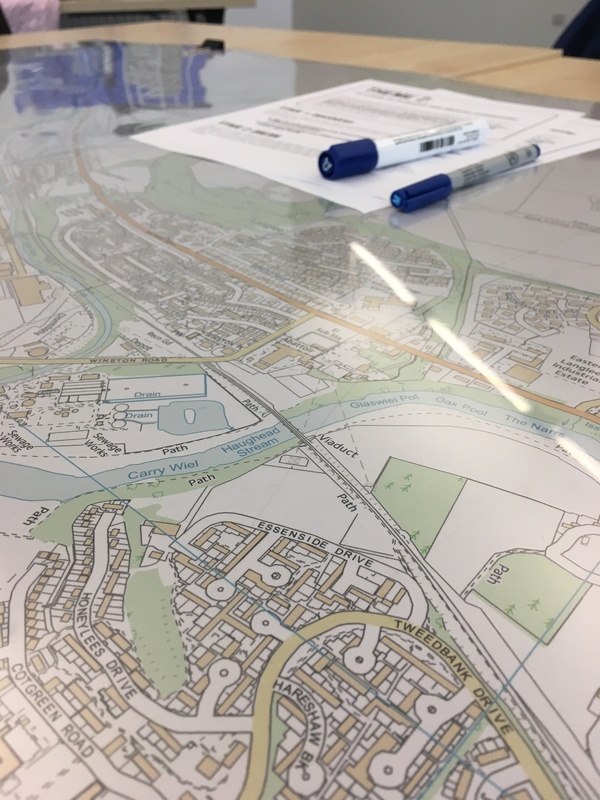 The workshops and the students were both unanimous that a new cycling and pedestrian route would transform the experience of travelling from the town centre west towards Tweedbank. A major proposition is a new railway station at Langlee to serve both the education campus and housing in that part of the town. 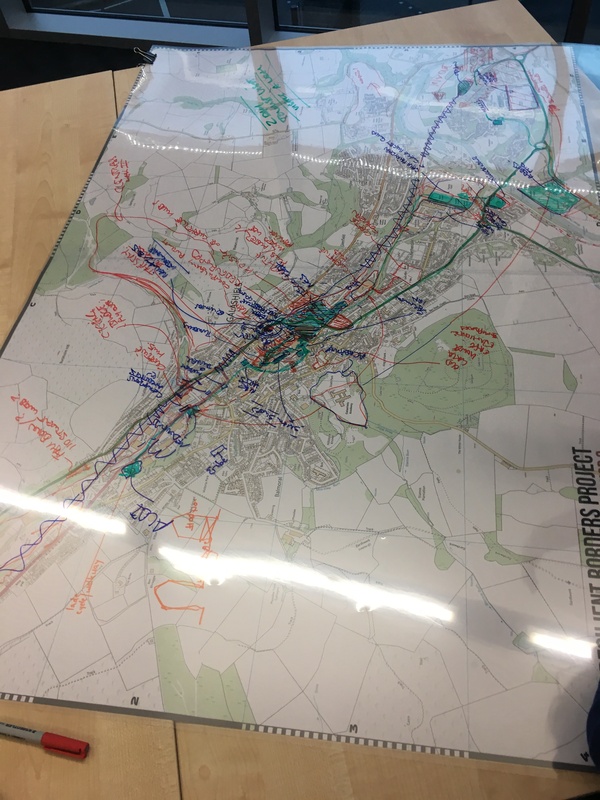 Large scale maps were provided for participants to directly draw and plot specific narratives and routes based on the themes produced in workshop 1. In the Discovery stage, groups drew different narratives and asked them to identify current resources that the town has to offer relating to each theme, in other words, “the best of what is”. 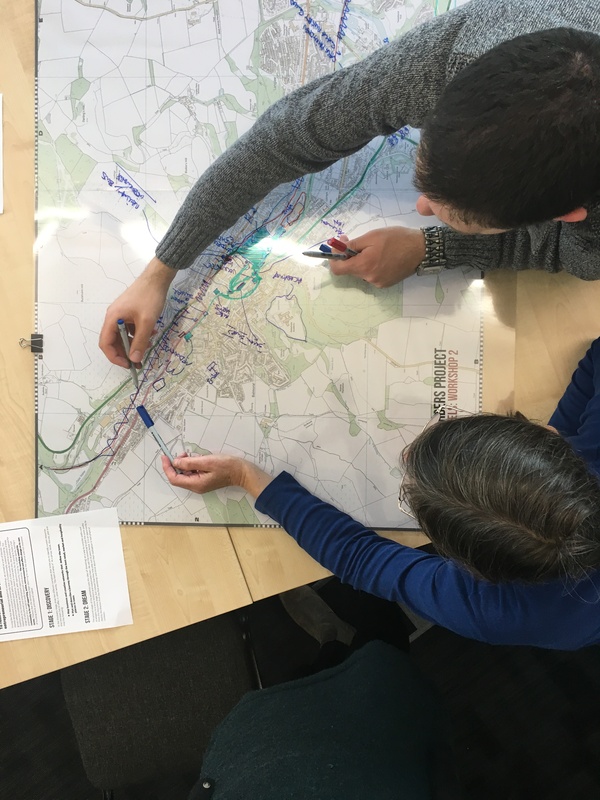 The second stage of the workshop used the idea of ‘dreaming’ as a way to consider paths and strategies to a more resilient and sustainable town. We asked the workshop to plot the same paths from the Discovery stage, but instead how they may play out 25 years hence. It served as an opportunity to deploy the themes from the first workshop and think about their realisation in real physical contexts. Narratives Theme 1: To weave Galashiels’ identity and place in the world. Map what a tourist might do to experience the best the town can offer. 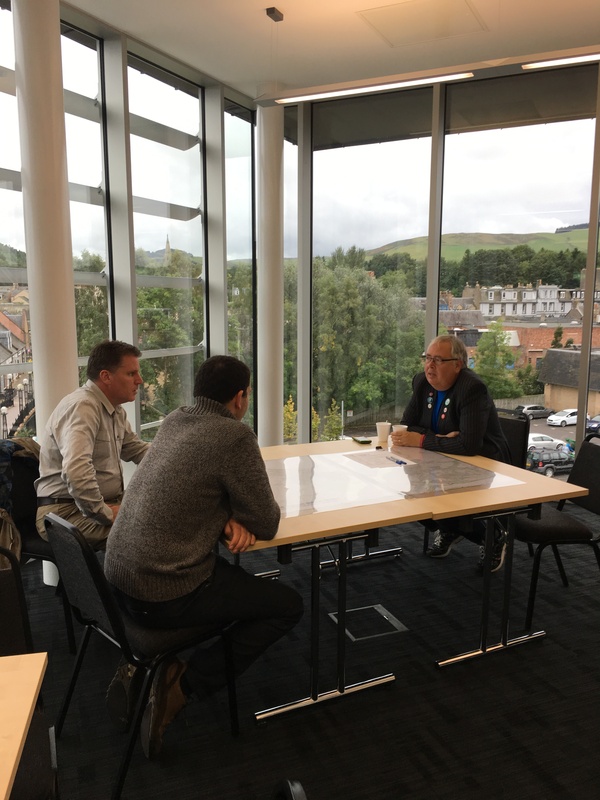 What places and spaces define Galashiels to the outside world? Narratives Theme 2: To create an inclusive and diverse community. Map the educational journey from preschool to higher education in Galashiels. Locate and link what you think are places that have high job satisfaction and/or opportunity. Narratives Theme 3: To reinforce a culture that is creative, entrepreneurial and in control of its future. Map business and creative networks that define the town. Plot and describe a journey through the best retail, market and hospitality places in town. Narratives Theme 4: To preserve and develop the best of the built and natural environment. g skilled jobs, great new tourism opportunities and a low carbon future. We used a Focused Discussion Method to develop a series of fundamental themes that help us understand the characteristics of a reimagined community. In general, the session invited participants to look at the student projects, discuss their initial responses, explore their significance as a community, and collectively arrive at a set of themes for future development. To weave Galashiels’ identity and place in the world. To create an inclusive and diverse community. To reinforce a culture that is creative, entrepreneurial and in control of its future. To preserve and develop the best of the built and natural environment.